A short while ago, "piposko" of Slovakia signed up for an account at Pokerstars. "piposko" surely had no idea that he was about to make history when he finished signing up for his account. "piposko" was the 20 millionth account on Pokerstars, which is a true testament to the sheer size and overall dominance of Pokerstars in the online poker industry. "piposko" was given a free $215 tournament ticket for being Pokerstars account #20,000,000. As Pokerstars points out, 20 million accounts is equivalent to every person in New York City, Chicago and Los Angeles signing up for an account. Canada has a population of approximately 30 million people - imagine if 2/3rds of Canada had an account at Pokerstars. 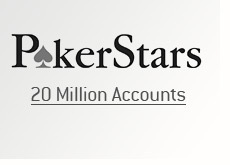 The numbers are truly staggering, and the unbelievable thing is that Pokerstars is still growing. They are by far the largest online poker room in the world, and there is nothing that would indicate that they are on the verge of slowing down. With the company's aggressive expansion into untapped markets such as South America and Asia, you have to wonder when the company will announce their 50 millionth account. Given the rate that they are growing, I wouldn't be surprised if they hit this number over the next 5-6 years. Unlike other sites in the industry that seem to be growing too fast for their own good, Pokerstars has managed to grow quickly while maintaining a high level of customer service. Kudos to Pokerstars, and may they continue to grow far into the future. They certainly deserve to be the largest room in the industry, and you would have a hard time finding anyone who would disagree with that sentiment.